JPMorgan Makes A Striking Discovery: "The Wealth Effect Is Dead"
Last week we highlighted that in the latest comprehensive revision to the national accounts data, the personal saving rate in 1Q18 was revised to 7.2% from a previously-reported 3.3%, with the entire series similarly shifted higher in the post financial crisis era. What caused this dramatic revision? As Macquarie's Viktor Shvets wrote earlier this week, the largest and most persistent revisions occurred not in compensation but in proprietary & investment incomes. In other words, for the bulk of non-supervisory employees (over 80% of labour force), there has been (at best) only limited change. However, proprietary incomes were raised by ~8%-10% throughout the last three years. The same occurred to rental and investment income. In essence, Shvets notes, "this is another side of rising income & wealth inequality, and when estimates are updated for ’17-18, it presumably would imply an even greater difference between mean and median incomes." 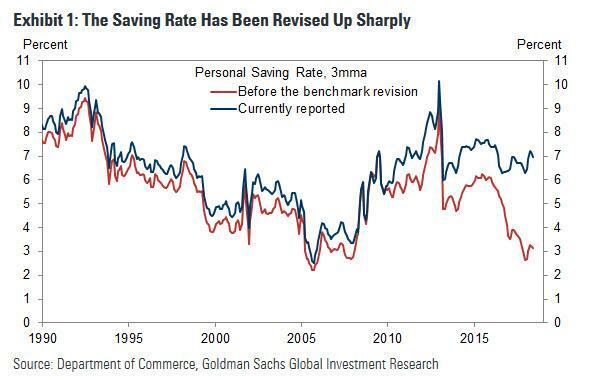 But whether the dramatic revision in the savings rate is accurate or merely the figment of some BLS excel spreadsheet's imagination, there is another - more troubling implication. Recall that as Ben Bernanke explained many years ago when he was actually telling the truth in a November 2010 WaPo Op-Ed, the whole point of QE was to boost the wealth effect, which is simply defined as the tendency of households to spend some fraction of an increase in net worth. Together with the Phillips curve, in the years prior to the great recession, the wealth effect was thought to be one of the more reliable regularities in macroeconomics: when household wealth increased by a dollar, consumer spending would increase by 3 to 4 cents and the saving rate would go down commensurately. 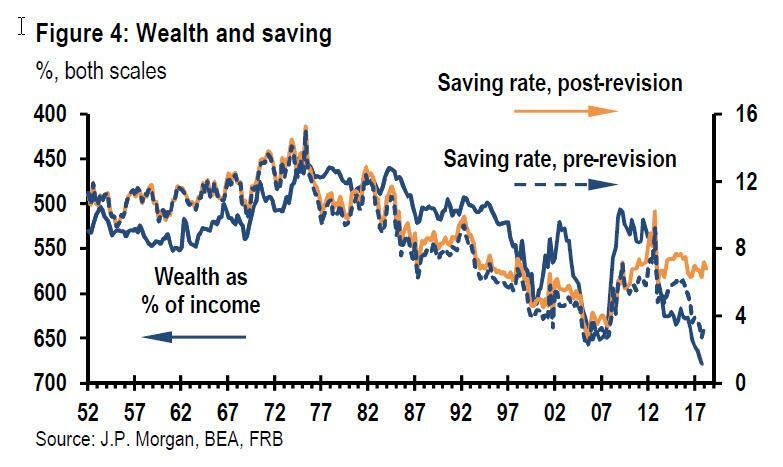 And indeed, as JPMorgan's Michael Feroli points out, when one overlaid the saving rate against the wealth-to-income ratio there was a reasonably solid correlation. However, beginning in 2014 - some 5 years into QE - we started to notice that the post-recession wealth effect was losing its power to explain saving behavior. In spite of a roaring stock market, the saving rate barely budged in the early years of the recovery. So fast forward to the latest savings rate revision, when as JPMorgan writes, "the wealth effect looks even weaker" because had pre-recession wealth effects played out in the current expansion, the saving rate would be predicted to be 2.0%; the latest upward revision places the data even further away from that prediction. It gets worse, because when the bank runs those same models since the end of the recession, "they indicate that the wealth effect has disappeared completely", Ferolid concludes. Whatever the explanation, the implication - assuming the latest revision is correct - of the surprisingly higher savings account revision is troubling: Americans simply no longer feel compelled to spend. And in an economy in which 70% of the economic growth comes precisely from consumer spending, this may explain why a decade into what will in 2 weeks be the longest bull market on record, there has been no actual recovery, but merely $15 trillion in central bank liquidity filling in the cracks and giving the impression of a recovery, even as households braced for the great recession - or depression - that will inevitably follow. 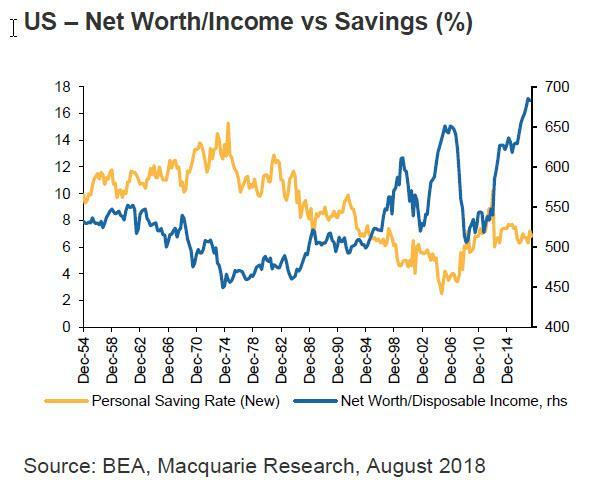 Echoing JPM's observations, Macquarie's Shvets writes that while higher savings might indicate that households were not dipping into their savings to maintain consumption, the caveat of unequal distribution and breakdown of asset-based economic model takes a lot of wind out of this argument. Since ’80s, strong & negative correlation emerged between HHs net assets and personal saving rates, as shown in the chart below. Higher net assets relative to income meant that people did not need to save. This in turn boosted growth, with rising asset prices underwriting excessive consumption. However, following revisions, personal saving rates have apparently not dropped as net wealth increased. So why is it a problem? To Shvets - as to JPM's Feroli - it implies a rising propensity to save and that wealth accumulation is no longer translating into usual boost to consumption. As a result, higher saving rate means that whether for financial, demographic or other reasons, LT growth rates would be lower, and the Fed, which was hoping for a rise in neutral/natural rates, might need to accept a far lower trajectory. As global economies financialized, r* has been dropping for three decades. Estimates indicate that it is now close to zero or negative in the US, Japan & Europe (vs 3%+ in ’90). The challenge with low r* is that it limits efficacy of monetary levers, reduces growth & lowers asset returns. This in turn may help explain why most central banks are so focused on escaping the liquidity trap and the confines of the zero-lower bound (not to mention QE). And all as a result of household willingness to be better financially prepared for the next crisis. Finally, Shvets observes that "higher US savings might also force very disruptive realignments in surplus countries (e.g. China, Germany)." While this would please Trump; his desire for high consumption, rising fiscal spending, current account surpluses, tariffs, and low US$ are all mutually incompatible. Macquarie's, and perhaps JPMorgan's, conclusion now that the wealth effect - the official impetus behind a decade of unorthodox monetary policy and trillions in liquidity injections - is dead: "Prepare for a lot of turbulence."